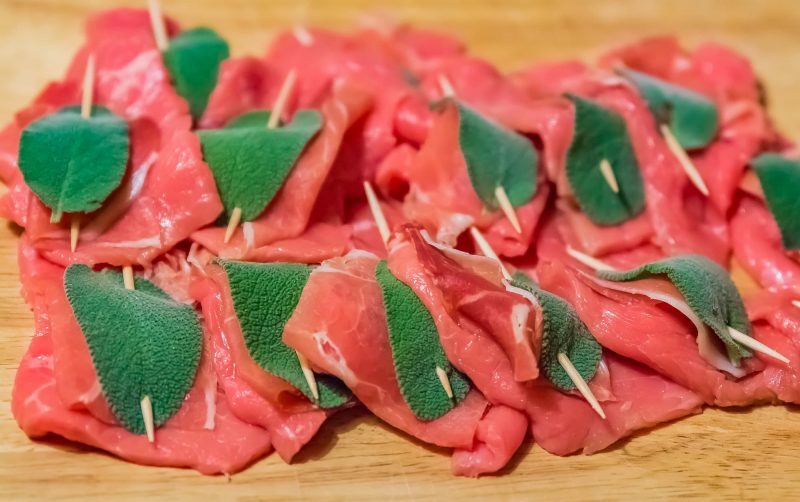 Meaning literally “to jump in mouth,” saltimbocca is an iconic Roman dish traditionally made with veal, prosciutto, and fresh sage leaves in a delicate white wine and butter sauce. With a short ingredient list, traditional veal saltimbocca—also called veal scaloppine or saltimbocca alla Romana—is remarkably simple to make. Modern variations include lightly flouring the meat, adding mozzarella, or even using chicken, turkey, or pork instead of veal. If you want to follow the more traditional methods, cook the scaloppine in a stainless steel or copper skillet rather than a nonstick pan so that you get sucs. Sucs are those little brown bits that form on the bottom of the pan when you cook meat, and they contain a lot of concentrated, rich flavor. These will be important when you make the sauce. Modern recipes suggest to add the wine when cooking the meat, which improves the flavor, especially when using a nonstick pan. 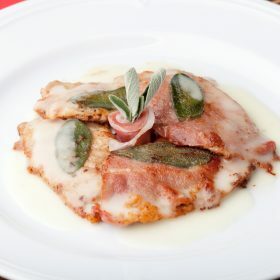 Although typically attributed to Rome, veal saltimbocca may actually have originated in Brescia, in northern Italy, where prosciutto comes from. It then migrated to Rome with the movement of the shepherds who first settled in the seven hills and became some of Rome’s original founders. The use of butter and the act of deglazing the pan are also uncharacteristic of traditional Roman cuisine. In contrast to this simple entrée, the food of ancient Rome contributed to a more gluttonous dining experience. In fact, ancient Rome was infamous for its rich aristocrats hosting decadent banquets. Lasting several days, these feasts sometimes consisted of as many as a hundred different courses. Veal saltimbocca is great with a green vegetable side, such as piselli alla romana, or Roman-style peas. A side of fresh or sautéed greens also complements this entrée nicely. Some more modern versions of the recipe even recommend serving veal scaloppine with pasta and marinara sauce. The ideal wine pairing is a red, fruity wine such as pinot noir, barbera, or rioja. If you prefer white wine, pinot grigio and orvieto bianco are also excellent options. Veal saltimbocca. Traditional dish with prosciutto and sage. Aside from the material of the skillet, another important detail of this recipe is the veal itself. Veal scallops, or cutlets, are usually cut from the top round, and they should be cut against the grain. In the U.S. they are most often cut with the grain, making the scallops more likely to curl and toughen when they are cooked. If you can’t find properly cut veal scallops, make sure to pound the meat very well to tenderize it. Each piece should be flattened to a uniform thickness for more even cooking. About 1/8 to 1/4 inch is ideal, as this allows the scaloppine to cook quickly without drying out. 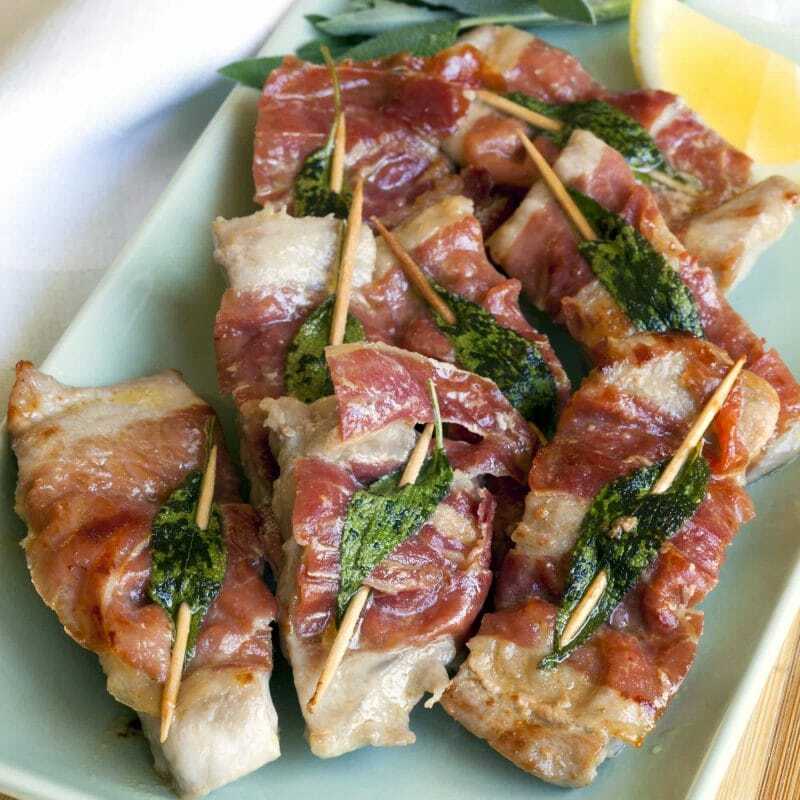 Although our recipe gives instructions for cooking the veal saltimbocca flat, others call for rolling up the layers. There are pros and cons to both methods. Leaving the scaloppine flat allows to cook faster and enhances the flavor, though fewer pieces fit in the pan at once. Rolling it up, on the other hand, results in more tender saltimbocca, but takes longer to cook. The order of the ingredients depends on preference. Placing the sage leaf on top of the prosciutto allows its flavor to mix better with the sauce. Putting it in between the two meats causes the sage to overpower the other rich flavors of the dish. Also, prosciutto tends to harden and dry out when cooked with direct heat, leaving it too salty. To prevent this, some recipes recommend cooking the saltimbocca only on the veal side. However, this doesn’t allow the flavors to fully mix, resulting instead in lukewarm prosciutto on a well-cooked slice of veal. The recipe below offers a good balance. Cook the scaloppine with prosciutto-side down for only a minute before flipping it over and cooking the veal. This draws out and blends the flavors of the sage and prosciutto without causing the prosciutto to harden. 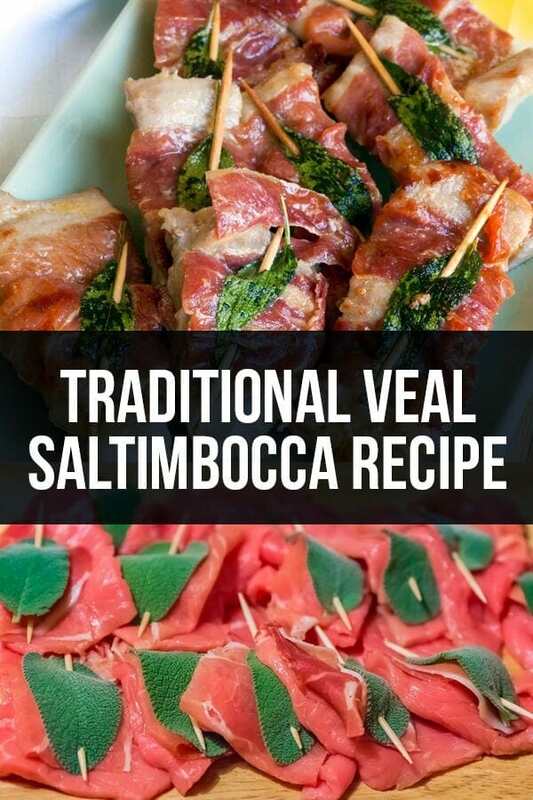 With this simple recipe for veal saltimbocca, it’s easy for even novice cooks to take a culinary journey to ancient Rome. Savor the delicate, buttery slices of veal flavored subtly with sage and white wine, and imagine the beautiful rolling hills of Italy stretched out around you. The preparation is so quick and the ingredients so few that you can treat your friends and family to this mouth-watering dish too—they don’t have to know how simple it is! This traditional Roman dish consists of veal and prosciutto and herbs. Enjoy this recipe which explain its origin and its pairings as well! Trim any connective tissue and loose meat off of the veal scallops, then pound them thinly between two sheets of wax paper or plastic wrap. Lay a thin slice of prosciutto and one sage leaf on top of each veal scallop, securing all of the layers together with a wooden toothpick. Heat a large stainless steel or copper skillet on the stove and add a splash of olive oil and a dab of butter. Once the butter is melted, place the veal in the pan sage-side down and brown for up to one minute. Be careful not to leave it too long, or the prosciutto will harden. Flip each piece over and brown for another minute or so. Season to taste with salt and pepper. Arrange the veal on a serving platter, remove the toothpicks, and cover with foil to keep warm. Add the wine to the hot pan and stir to scrape up the sucs stuck on the bottom. Bring it to a boil, then cook for two to three minutes or until the sauce is reduced. The sauce should be silky and just thick enough that when you pull a spoon across the bottom of a pan, it leaves a clean trail behind it. Remove the pan from the heat, stir in another dab of butter, and pour the sauce over the veal. 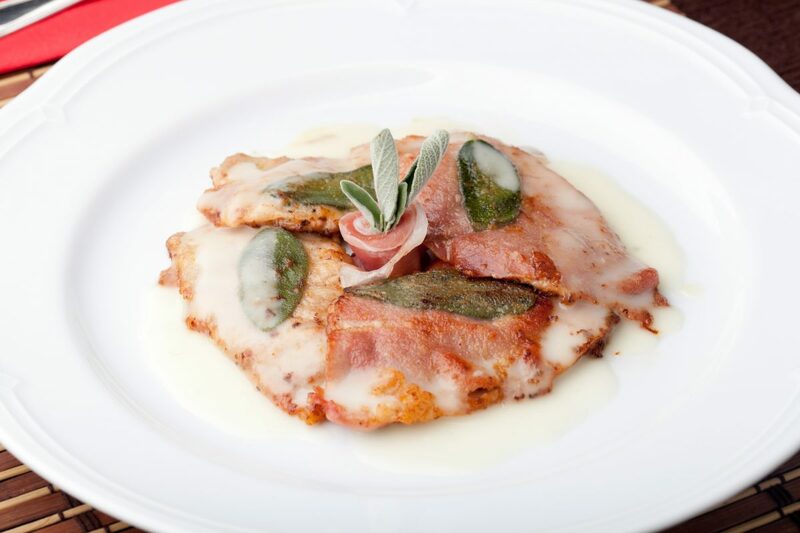 Enjoy the veal saltimbocca while it’s still hot!